Region IX, also known as Zamboanga Peninsula, consists of three provinces, namely, Zamboanga del Norte, Zamboanga del Sur, and Zamboanga Sibugay, and the chartered city of Zamboanga City at the south-eastern tip. The Zamboanga Peninsula was previously known as Western Mindanao before the enactment of Executive Order No. 36 on September 19, 2001. Between 1975 to 1989 the old Region IX (Western Mindanao) was divided into two sub-regions by Presidential Decree No. 773 dated August 21, 1975. 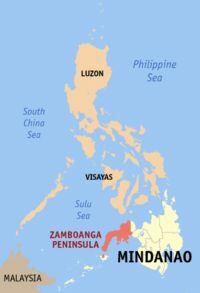 Zamboanga Peninsula consists of the territory of the three Zamboanga provinces and its lone chartered city of Zamboanga City, plus Misamis Occidental. The Zamboanga Peninsula is connected to the main part of Mindanao Island through an isthmus situated between Panquil Bay and Pagadian Bay. The boundary between the peninsula and the mainland is artificially marked by the border between the provinces of Zamboanga del Sur and Lanao del Norte. Zamboanga Peninsula lies between the Moro Gulf, part of the Celebes Sea, and the Sulu Sea. Along the shores of the peninsula are numerous bays and islands.